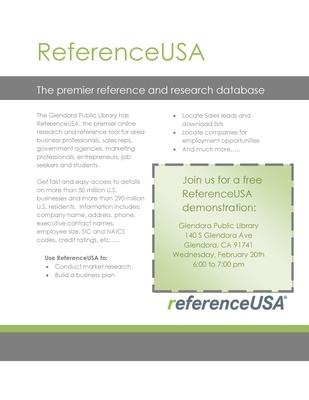 The Glendora Public Library has ReferenceUSA, the premier online research and reference tool for area business professionals, sales reps, government agencies, marketing professionals, entrepreneurs, job seekers and students. Get fast and easy access to details on more than 50 million U.S. businesses and more than 290 million U.S. residents. Information includes; company name, address, phone, executive contact names, employee size, SIC and NAICS codes, credit ratings, etc…..